Review: I admit that I was immediately attracted by the sublime cover that the book presents here, how not to be? In addition, the title also made me curious, I have the same name as the heroine. Something that I must say is quite rare. So you can imagine that I was eager to see how the story was going to be. Delia has been seeing ghosts for a long time, but for escaping all that, she went to work in New York for a few years and it seemed to work. At least until one day, a shadow appears and seems to haunt her. This girl wants our young heroine to discover what happened to her. 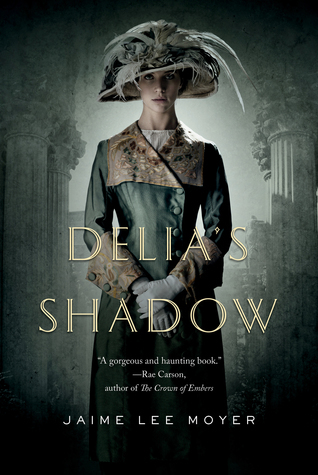 So for that, Delia returns home to find her best friend and her mother who is really sick. But the ghost becomes increasingly persistent and our young woman will find herself involve in a much more complicated story than she would have expected. Indeed, she will be at the heart of a police investigation where a serial killer seems to have resumed service after many years. And her ghost appears to have been a victim of this man and Delia is the only one who can help the investigation move forward. But at what price? I admit that I was curious to see how the investigation would turn and especially who was behind the murders. I confess that at the end of the novel I was quite surprised to see who the culprit was. Many people are involved in this investigation and I loved to follow the progress of the case. Delia is a very brave young woman despite everything she had to go through and I must say it is very difficult to see her facing so many trials. She could, however, get rid of the ghost but remains determined to help and understand what happened to her. In this investigation she meets Gabe, a policeman very involved who is still struggling after the death of his wife a few years ago. Yet once met, the two characters will change and enjoy each other a little more at each of their meetings. It was a good story, involving an intriguing mystery and I liked how the author managed to lead her plot gradually. A great novel a little different from what we can usually read. This entry was posted in Fantastique, Jaime Lee Moyer. Bookmark the permalink. I agree completely with your review, I also noticed the character’s name, but hers is missing an H.
Wee! So glad you see you loved this. I enjoyed this novel myself, I’m looking forward to reading more novels from her. This sounds good, Melliane. I like the backdrop of the story and it sounds like the mystery was done well. I’m definitely adding this to my tbr. This does sound nice. I like psychics in books.